There are so many options for tours in Scotland and Ireland but here is a suggested route through the Highlands and Islands to whet your appetite. Ideally you would need around 10 days to do this route justice but we can work around whatever time you have to create your perfect tour. Departing from Edinburgh head north to Perthshire. Here you might stop to visit Scone Palace, where Kings of Scotland were crowned in ancient times, or perhaps Blair Castle, ancestral home of the Dukes of Atholl. Then head north over the Drumochter Pass to the Cairngorms National Park, where you have the option of a stop at the Highland Folk Museum or a ride on the funicular railway to the top of the Cairngorm Mountain. North again you reach Culloden where you can visit the battlefield site where Bonnie Pronce Charlie’s Jacobites were finally defeated by governement troops in 1746. From Culloden it’s only a short hop to Inverness, the “Capital of the Highlands”. Leaving Inverness head west along the shores of Loch Ness. At the village of Drumnadrochit you have the option of a stop at the picturesque ruins of Urquhart Castle or perhaps you prefer the Loch Ness Monster Exhibition, or take a boat trip out onto the loch to try and spot Nessie for yourself! Keep your camera at the ready – one photo of the exlusive beast and you’ll never have to pay for another holiday again 🙂 Continuing north west you pass through the Kintail area where you might visit the superb Eilean Donan Castle before crossing the bridge to the Isle of Skye. 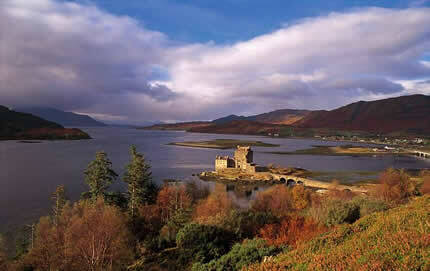 Here you can explore the mountainous landscapes and deserted coastline, visit Dunvegan Castle, home of the Clan Macleod, or try a drop of the hard stuff at the Talisker Malt Whisky Distillery. Leaving Skye you head south and take the ferry back to Mallaig on the mainland. You cross the Morvern Peninsula and take another ferry for the short crossing to the Isle of Mull. Here you can visit the tiny island capital of Tobermory, discover windswept sandy beaches and visit Duart Castle, ancestral home of the Macleans of Duart. The island of Iona is a short distance away: a site of Christian pilgrimage for centuries, St Columba founded an abbey here in 563AD. From Mull & Iona you cross back to Oban on the mainland and head south through the Kilmartin area. Kilmartin Glen is home to the highest concetration of Bronze Age and Neolithic remains in Scotland, and you will find many standing stones, a henge monument and burial cairns. Continuing south down the Mull of Kintyre you reach Kennacraig where you take the ferry to the island of Islay. This little island is home to eight whisky distilleries and you can take a tour of the likes of Lagavulin, Bowmore or Ardbeg. You could also take the ferry over to the Isle of Jura for the day or a boat trip to see the Corryvreckan Whirlpool, one of the largest in the world! Leaving Islay you return to the mainland and turn east to Inveraray where you can stop to visit the 19th century Inveraray Jail or the impressive Inveraray Castle, home of the Clan Campbell. You turn south along Loch Lomond where you might like to take a trip out on the loch or simply soak up the beautiful scenery, before contiuning south over the Erskine Bridge to the city of Glasgow. Your tour ends with some time in bustling Glasgow, renowned for its many museums and art galleries including the Burrell Collection, the Kelvingrove Art Galllery & Museum and the excellent new Riverside Museum, which deals with Glasgow’s ship building and industrial heritage.